This time, it's no Mishap! This time it's no Mishap - it's Intentional! 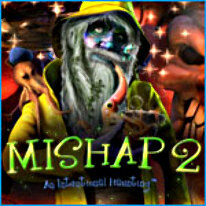 Join the Mishap gang to help Milton Hobblepop infiltrate the shadowy compound of his greatest rival, Avery Nailliv, and stop the scientist from imprisoning more spirits! With hidden objects and supernatural puzzles stashed in every room of Nailliv's estate, you'll need all of Hobblepop's gadgets to defeat a cast of eccentric spirits!